Italy I Love You is a state-registered tour guide company and only works with first-class registered and trained professionals. Italy I Love You is an Italian touristic guide company with over 30 years of experience of providing guided visits, experiential tours and themed journeys of the highest quality, led by high profile tour guides capable of satisfying the most discerning of clients. 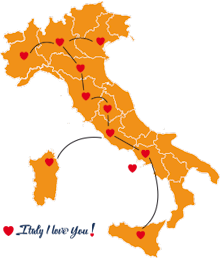 Italy I Love You provides tour guides in Italy through to its consolidated network of guides located in Italy’s main cultural and artistic destinations. This guiding network extends across the whole Italian territory bringing together the very best tour guides. Our handpicked guides have more than 20 years of professional experience and all share one common characteristic – their passion. They all love their country and are keen to share their deep knowledge of Italy in all of its nuances, both from a cultural point of view and its artistic and food and wine heritage. We have a database of tour guides available to you, all of whom have a background in either architecture, design, fashion, the culinary arts (with encyclopaedic knowledge of the country’s local foods and wines), collection, antiques, museums, art galleries, dance, theatre, walking tours and more. There are also multilingual guides. Contact me to tell me what type of trip you are looking for and I will create an exclusive experience just for you!